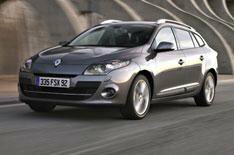 Full Renault Megane Sport Tourer details | What Car? Renault has confirmed prices and full specification details for its new Megane Sports Tourer. There's a £950 premium over the five-door hatchback and the entry-level 1.6 100 Expression costs £15,485, and the 2.0 dCi 150 Auto tops the range at £22,785. Expression trim includes air-conditioning, curtain airbags, stability control, a folding front passenger seat, four electric windows and roof bars. Moving up to Dynamique adds 16-inch alloy wheels, automatic lights and wipers, Bluetooth and MP3 connection and leather steering wheel trim. The TomTom Edition is based on Dynamique trim, but adds Renault's fully integrated Carminat TomTom satellite-navigation system for an additional £360. Buying it as an option would normally cost £450. Standard kit on top-trim Privilege models includes dual-zone climate control, electric folding door mirrors and a rear armrest with storage. Options include 17-inch alloy wheels for £300, an automatic parking brake for £150, leather upholstery for £900 and front and rear parking sensors for £400. The Renault Megane Sport Tourer is available to order from June 29 and is expected to reach showrooms in August.